Dressage is the harmonious development of the physique and ability of the horse. This development makes the horse calm, supple, and keen achieving a more perfect understanding with its rider. Riders in all disciplines of riding are turning to dressage as a foundation to develop a responsive calm mount. Riders strive to learn how to sit in perfect balance and give the horse invisible commands with legs, weight and reins. It is important that respect and obedience of the horse not come through force or artificial means. Force results in stiffness and a decrease in athletic performance. Dressage is for everyone: Beginners and advanced riders; English and Western riders. Anyone who really cares about horses and desire an obedient, balanced and sensitive animal that responds calmly and promptly to it’s riders signals. Dressage training is rooted in three basic principles: Forward – The ability of the horse to move willingly and freely forward inn all paces and throughout each movement. Straight – The ability of the horse to remain straight throughout its body while moving on straight lines with equal flexibility and development on both sides of the body. 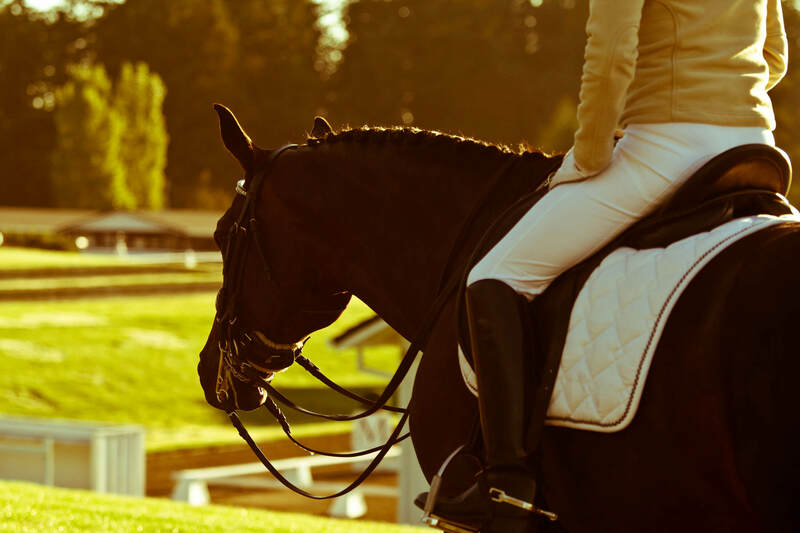 Calm – The ability of the horse to remain relaxed, attentive and submissive while responding to its rider Dressage training follows a logical progression from simple to complex. Once training progresses past the basics, dressage becomes more specialized. The added strength, suppleness and concentration is seen in the horses ability to perform difficult and complex movements. A Dressage horse show is unique. Horses of any breed and size are welcome dressage competitions. The purpose of dressage judging is to evaluate performance, not conformation. In competition, each horse and rider does a “test”, a pattern of exercises of approximately 5-10 minutes in length, alone, in a marked rectangular arena. Each movement in the exercise is judged and scored on a scale of 0-10. Tests are graduated for both horse and rider from “Training Level” thorough “Fourth Level.” They are designed to let horse and rider demonstrate that they have mastered the objectives and standards for that level. It is kind of like the compulsory floor exercises in gymnastics. If the test is done well, the horse looks like it’s doing everything on its own. Ideally, horse and rider should look like they are having fun. Of growing popularity is the musical freestyle. A rider picks a piece of music that fits the rhythms of his horse’s movements – classical, jazz, rock. The rider then choreographs a routine that incorporates certain required movements where he thinks they will show the horse to best advantage. The horse looks like it is skipping, strutting, doing pirouettes and moving in perfect rhythm to various pieces of music. In other words you take a backyard animal and teach it to perform ballet. You don’t have to go to Europe or the Olympics to see this type of riding. The Oregon GMO of the U. S. Dressage Federation (USDF) is one of the largest in the country with 800 members. Considering the size of Oregon’s population, that is a lot of dancing horses per capita, (California’s chapter is the largest with 4.035 members) Competitions are held throughout the Northwest from late February until mid November.